The Ohio River Basin is a region of 204,000 square miles covering parts of 14 states and including a population of nearly 25 million people, many in such major cities as Pittsburgh, Columbus, Cincinnati, Louisville, Indianapolis, and Nashville. 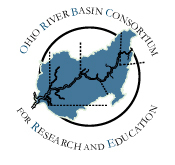 The Consortium involves researchers and educators from throughout this basin, not just those concerned with the mainstem of the Ohio River. The Ohio River itself flows 981 miles from Pittsburgh to Cairo, Illinois, where it joins with the Mississippi. The navigation in the river and its tributaries relies upon the 19 locks and dams the mainstem of the river as shown in the following. Water-related problems in the Ohio River Basin include effluent from municipal wastewater treatment plants, combined sewage and storm water overflows, urban storm water, acid mine drainage, agricultural and forest lands runoff, sedimentation, toxic pollutants, problems from oil and gas recovery brines, reservoir sedimentation, ground water pollution, and drinking water contamination, emerging pathogens, and exotic aquatic species. The region has been cited as a major contributor of acid precipitation for areas to the northeast and has a number of hazardous waste disposal sites.